HEAT ADVISORY: DO NOT INSTALL GRAPHICS ONTO A HOT WINDOW WHILE EXPOSED TO DRASTIC SUN EXPOSURE. EXTREME HEAT MIGHT CAUSE DAMAGE TO THE DECAL. PLEASE WAIT UNTIL THERE ARE NO SUN RAYS DIRECTLY ON GLASS YOU WILL BE COMPLETING THE INSTALLATION. AVOID INSTALLING DECALS IN TEMPERATURE OF 90F OR HIGHER. LOW TEMPERATURE ADVISORY: DO NOT INSTALL YOUR GRAPHICS IN A BELOW 50 DEGREE F. TEMP. THERE IS A CHANCE OF CRACKING IN GRAPHIC WHILE REMOVING THE TRANSFER PAPER. THE ADHESIVE OF THE GRAPHIC DOES NOT STICK ONTO GLASS AS WELL AS IT WOULD DURING ROOM TEMPERATURE. WE ADVISE ON INSIDE OF GLASSINSTALLATION ONLY. DO NOT USE WATER AND SOAP. FLIP THE DECAL UPSIDE DOWN (TRANSFER ALONG WITH THE DECAL) SHOULD BE FACING DOWNWARDS FACING THE TABLE OR ANY FLAT SURFACE YOU HAVE LAID YOUR GRAPHICS ON. 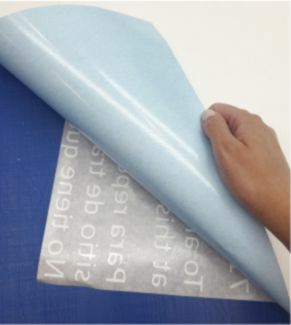 REMOVE THE BACKING OFF FROM THE TRANSFER AND DECAL (AT THIS POINT YOU SHOULD HAVE YOUR DECAL LAYING ON THE TABLE WITH THE ADHESIVE SIDE FACING UP) WE CALL THIS THE "REVERSE REMOVAL" WHICH MIGHT WORK BETTER IN HUMID CONDITIONS. IF INSTALLING ON THE OUTSIDE OF GLASS: DO NOT INSTALL DURING WINDY OR RAINY CONDITIONS. Install your decals within 40-50 days of purchase for best results and to avoid damage to the decal/graphic. Keep in a DRY place and in Room Temperature. Do not get the decal/graphic wet before installation and do not store your decals in direct sunlight. All graphics and decals are personalized to meet your specifications. They are non-refundable, non-returnable, and there are no exchanges. If your decal arrives damaged, you may return the product in exchange for a full refund as long as the product is returned to JS Typography unused and with any tools we have provided for installation purposes. Please note JS Typography does not pay shipping costs for returned items.